1468 NW 153rd Ave, Pembroke Pines, FL.| MLS# A10553050 | Susan J Penn l Best Agent l Buy & Sell South Florida Homes! WELCOME TO TOWNGATE PEMBROKE PINES. 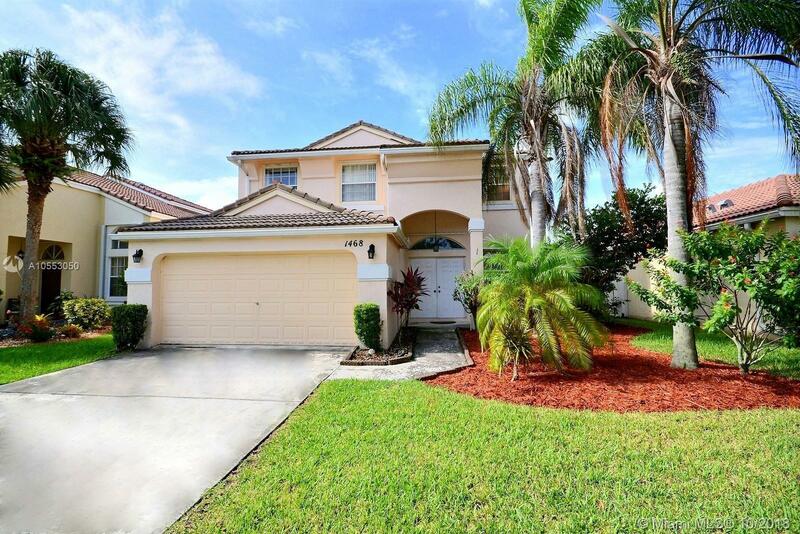 AWESOME HOME IN ORCHID VISTA GATED COMMUNITY FEATURES 4 BEDS, 2.5 BATHS, VERY SPACIOUS AND OPEN FLOOR PLAN WITH ROOM FOR THE ENTIRE FAMILY. LIVING/DINING AND FAMILY ROOM, EAT IN KITCHEN W ISLAND AND BREAKFAST NOOK. LARGE MASTER SUITE WITH TRAY CEILINGS, BAY WINDOW, MASTER BATH WITH DOUBLE SINKS, SOAKING TUB & SEPARATE SHOWER. RESORT STYLE AMENITIES THAT INCLUDES 2 SWIMMING POOLS, TENNIS COURTS, CLUB HOUSE, BASKETBALL COURTS AND MORE.